I’m always a little late to the party. For example, last week, the Super Bowl festivities took place. But honestly, I have an excuse. Actually I have a few. Since I don’t live in America, there isn’t much enthusiasm for American football around here. When I tried to explain the concept of the grandeur of Super Bowl Sunday to Romain, he gave me that typically blank stare which is sort of a signal to not even bother with an explanation, because it made my head hurt thinking about it. Equally unexplainable, he asked; “Do you understand American football?” and it took me about one second to respond, “Non“. But truthfully, who on earth does? All I know is that those games seem to go on and on and on forever. One team runs a few yards and knocks down someone. Then they all take a break, walk around, talk to each other, pat a few behinds, the cameras scan the crowd, then they do it again. After a few more tackles, breaks, and changes of direction, there’s ten minutes of shaving commercials before the non-action resumes. The other excuse is that I was busy making me some chicken wings. Although I wasn’t preparing them the Buffalo-style way, equally incomprehensible was the concept of chicken wings with bleu cheese dressing and celery sticks. Le poulet, he got. But when I started talking about mixing up bleu cheese dressing and dipping chicken in it, his eyes opened wide, and all he could say was, “Do they use French bleu cheese?” with a little bit of incredulousness. I didn’t know how to explain to him that a majority of the people who dip wings in bleu cheese dressing aren’t all that concerned with the provenance of the cheese. And when I added that celery sticks were de rigeur, even I had to admit that it made no sense to me either. Those crazy Americans! Some around here also can’t fathom my fascination with Korean food and I would venture to say that my apartment probably smells more of kimchi than any other in Paris. But I love grilled and fried foods, especially those that are spicy and a little sweet. And often, Korean foods fit that bill. I’ve learned a fair bit about Korean cooking from a wonderful site by Maangchi, whose videos I watch when I want to see how Korean dishes are prepared, since I’m about as far from Korean as I am from Parisien. Her Sweet and Crispy Chicken caught my eye a while back, since I love deep-fried chicken perhaps more than anything of all. A while back there was an article about words in recipes that are “deal-breakers”, terms and techniques that turn a reader off to making a recipe. For me, when a recipe begins with the line: “Heat 2 quarts of oil for deep-frying”, I turn the page or click away. I love deep-fried food, but it seems like a waste to heat all that oil, and the clean up afterward is a nightmare. Maangchi deep fries her wings, twice, so they’re extra-crispy. But I used my ActiFry machine. And after a few minutes in there, my wings developed a crispy surface and the skin was starting to actually sizzle. And about thirty minutes later, my wings were on their way to a Super Bowl-worthy, sweet victory. You can watch her Dakkangjung video on how she makes these wings lording over her jumbo, sizzling wok. But I’m thinking the wings could be baked first, then slathered with the sticky sauce. I loved these wings and so did everyone else that nibbled on them around here. So much so that I became a full-on fan of Maangchi. If you taste these wings, you’ll be an instant fan, too. 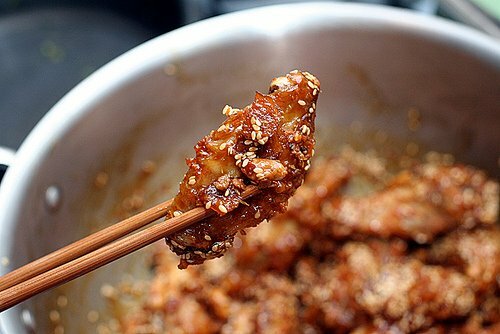 Adapted from Dakkangjung: Sweet & Crispy Chicken from MaangchiI made a few changes to the original recipe. One was that I used the corn syrup, which I buy at Ace Mart, the Korean shop in Paris.I divided her recipe in half, since it made a lot of wings. So if you’re having more people over, feel free to double the recipe. 1. In a large bowl, mix together the flour, starch, egg, salt and 1/2 teaspoon ground chili pepper until it’s a thick paste. Add the wings and mix with your hands until they’re thoroughly coated. 2. Put the coated wings in the ActiFry and drizzle with the oil. Close the lid and cook for 35 minutes, until brown and crispy. Or the deep-fry the wings in a pot of hot oil (Maangchi recommends 350º-380ºF, 177º-193ºC) twice, in batches. Then drain well. 3. In a large pot or wok, bring to a boil the water, ginger, soy sauce, brown sugar, vinegar, and corn or rice syrup. Let cook until the mixture becomes syrupy and thick, and starts to foam. It should be about as thick as honey. 4. 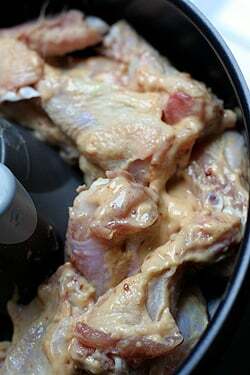 Turn off the heat and stir in the cooked wings, peanuts, sesame seeds, and chili flakes, until completely coated. If you’re going to post wings like these, you are definitely forgiven for being a little late to the party. When I read sweet, crunchy, and spicy, it’s as though someone is whispering sweet nothings in my ear. Perfect – Super Bowl or no Super Bowl! Ha! That is the most hilarious (and frankly, accurate) description of American football I’ve ever read. Oh, and the wings look delicious, too. now that looks good. might have to try this one. 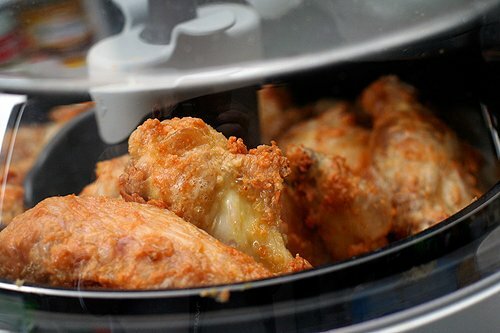 Food & Wine just did an article on Hot Wings (OK, a month or two ago). It’s a great no-fry recipe that results in tasty, crunchy, delicious wings. They suggest a number of good sticky sauces as well. We’ve made the Maple Chipotle one a couple of times now, and it’s a definite keeper. 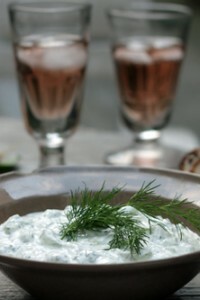 have you ever tried Ossek Garden at 14 rue Rampon, 75011? We were amazed at how authentic their Korean food was. It’s so hard to find truly authentic Asian food in Paris (so much of it is Frenchified). Plus they have the most delicious Korean alcoholic drinks; sort of their own versions of sake. And the food is so good, we had a hard time stopping, even though we were ready to burst. I laughed out loud reading your description of football. I feel the same way! When I watch football my mind immediately tunes out and I end up staring at the tv not even knowing (or understanding) what the heck is going on. Fortunately my kids have learned to like it so at least my husband has someone to watch with. The wings look amazing. Thanks for the recipe! This look delish..I love that type of food. I don’t think its so much the players being pansies so much as the managers not letting them. Those players do make the managers quite a bit of money, and if they’re all concussed and loopy, nobody’s gonna watch! I also give a flying fluff about football. What’s more interesting at the Super Bowl parties is usually the food – all sorts of indulgent fried and cheesy foods. Love the Korean touch to those wings. Am still amazed that you get something so gorgeous with so little oil in the Actifry. This post reminds me of Vietnamese wings with a peanutty hoison sauce. we had some god-awful wings during our superbowl fiesta. a little traumatizing. after i get over that experience, i will give yours a go. 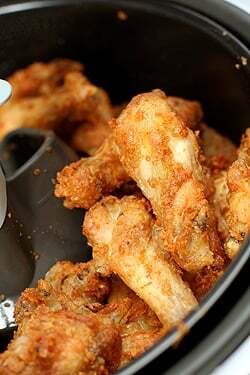 Yummy wings, must try — I made Super Saints Mojo Jambalayla in honor of the Saints for the Super Bowl — it was soooo good! Pardon my giggle. I’ve tried to appreciate football, really I have, but the backround noise is like a lullaby and it just puts me to sleep. I did hear a sweet story about a sports writer in New Orleans. He apparently promised to walk down one of the main streets in women’s clothes if they won. His health gave out before he could see them win, and a large group of locals kept his promise for him, as a means of celebrating both the writer and the team’s victory. These wings look amazing! I’ll have to check out Maangchi and the Actifry machine when time allows. Thanks for a beautiful post, David. Oh, honey, around 2000 men wore dresses here for Buddy D (link here if you want to see pics – http://www.nola.com/superbowl/index.ssf/2010/01/photos_buddy_d_dress_parade_pa.html) and I don’t know nuthin’ ’bout no football either, but Carnival has been in full mode for several weeks, and football party food here is not to be missed either. Your recipes have helped a few of those parties. Aside from the Saints dominating the paper just about every day, the other articles tend to be about food for the parties, one with several recipes for chicken wings and where to buy ready-made. The funniest was Indianapolis wanted to give New Orleans tips on how to run a parade. I can’t believe we have to go through one more week of celebration before Ash Wednesday shuts us down (at least a feeble attempt). I’m actually looking forward to Mardi Gras midnight. Thanks, as usual, I check in almost every day and am amazed at your output, and the quality. @Andi – I also make my wings the “Alton Brown Way” and we love them. We steam them, then throw them in the fridge for an hour, then bake, then toss…..we get compliments on them every time! OK, This looks soooooooo super delicious!!! I must make this soon. Thanks for the great recipe. (You told me you can’t post it here! – on facebook, but I’m very glad you did). These type of chicken recipes (either Dakkangjung or more commonly yangnyum (literally seasoned or sauced) chicken (which is fried chicken coated with sweet, spicy and sticky sauce) are the ones very hard to find in the States (most regular Korean restaurants don’t have them). At the same time, I also turn pages over when I see “deep fry” in the recipe (mainly because I have no idea what to do with the leftover oil), so I didn’t even try to make wings at home. Ah, also by the fact that I’m scared of the tip part of the chicken wings. :) But with your post, there’s no way I can pass this up. Thanks to Ariel for the baked wings URL, I will definitely try this! My mouth waters already. Btw, I love your “required” question for posting. I guess if I don’t know where you live, probably I shouldn’t post anything here, right? Hehe. I thought a Frenchman would question why you are eating only the wings. There is so much more to eat on the rest of the bird! I’ve never got on this bandwagon- all that work for a tablespoon of meat hidden among skin and bones. Your wings look delicious, I read your blog and Maangchi’s blog consistently! Now I really have to make these! I think you’re awesome by the way! I’ve always been loathe to use that much oil, too, so I’ve roasted wings instead, to no ill effect. They’re just as delicious! But a friend told me about a new kind of fryer that doesn’t use a lot of oil – perhaps this is it? Now I’m intrigued! I’ll have to check it out. I have to say that I love you even more for loving Korean food. I just had a Korean food-making frenzy last week. I’m so happy I finally subscribed to your blog. Your assessment of “American” football is right on, however, there’s nothing crazy about Buffalo wings and blue cheese dressing and I’m not even from the States. And @Andy and ColaJae, I came across Alton Brown’s recipe for wings this past weekend and had I know that it was that easy to make really good Buffalo wings, I would’ve made them a long time ago. I heard Dianne laughing in her office a few minutes ago, reading your latest post. Well, that got my attention, so I just finished reading it. Now I’m hungry. Love your description of Football. And if you think that is slow, try Baseball. No wonder these sports are called an American past-time. Oh well I’ll save it for the World Cup. PS I think people eat wings because you get a lot of skin to meat ratio and the skins= the best part…but the cholesterol es no bueno. That’s why we’re all fat. You could explain it them that way maybe? 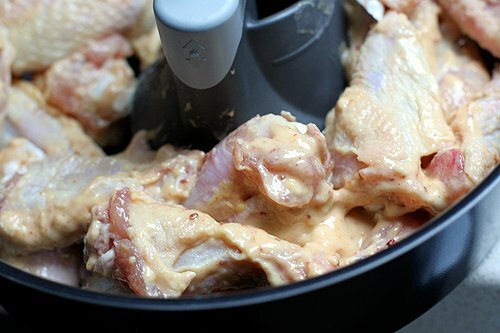 You recently mentioned your obsession with silicone spatulas and I saw one off to the side stirring your chicken wings. I used to use the Le Creuset colorful spatulas or the Williams Sonoma version, but the wood handles wore out long before the silicone spatula and I grew tired of separating the pieces, and waiting for the inside of the spatula to dry so I could reassemble and put it away (or else mold would grow inside). I have to tell you I found the best silicone spatulas here in Paris. They are silicone, super heat resistant, all one piece and they cost about 8 euros. You can find them anywhere….BHV, small cooking stores, and of course in Gallerie Lafayette and Printemps. I actually bought mine at L’Atelier des Chefs where the chefs use only these spatulas now. They come in bright colors and you can just leave them in the pan because the handle is as heat resistant as the spatula. Like all silicone, they do absorb the flavors of your food so I have a sweet and a savory version of each. Oh yeah….and the brand is Mastrad. Karen: French folks do eat wings and poultry dealers sell ailes (wings), sometimes already roasted, although you don’t seem them consuming them in big buckets like you do in the states. Many here, I suspect, are sold for making stock making as well. Marios: Yes, there is a bit too much Frenchifying of Asian food. But in spite of the recent wave of ‘sushi’ places with industrial sushi packed in plastic boxes, there are some very good Japanese and Korean places now in Paris. The Japanese places on rue St. Anne are authentic and good, and the new K-Mart on the same street is a big Asian food store with a sit-down cafeteria that’s kinda fun, too. I like the roasting method better because it means there’s the actual flavor of chicken, and not just breading and oil. Freeze the wing tips and use them for stock. and don’t buy ready-to-eat chicken wings in France. Dismal. I’m working on a tequila-lime version….at least if it doesn’t work out, I’ll have a good use for the ingredients. Gaw, these look good! I love wings. I moved away from Washington DC to the SF Bay area eons ago and left football fanaticism there; though to some, it’s religion here too. Snore. Superbowl is all about the food for me! We experimented with the Alton Brown method of preparing the wings last year and I am converted. Steaming them gets the excess fat from the skin and yet they bake up crispy. I’m sold on the method as there was nothing I hated more than that chewy, rubbery quality that most wings have when cooked any other way than deep frying. I’m not a fan of the Buffalo wing, but I do love the Asian preparations. Can’t wait to try this recipe. 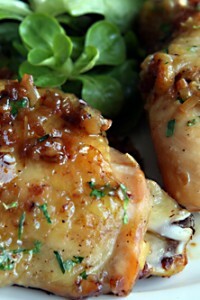 If you live in the SF Bay Area, you can find this style of chicken here: Oriental B.B.Q. Chicken Town in Oakland. So yummy with a bottle of beer and some sticky rice. Is it any coincidence that the only person on earth who could explain how American football works is also the only person on earth who could explain what a Turducken is? Of course, it is John Madden of whom I speak. Viridian Farms in Oregon sells haricots tarbais. they go to France and Spain to source many of their beans. just reading your post Do You Know Beans? Les Haricots Tarbais and found out they were the haricots blancs traditionally used in cassoulet. going to try your bean recipe. American Football is rugby for people too afraid* to play real rugby. Of course one has to understand rugby to understand this explanation. 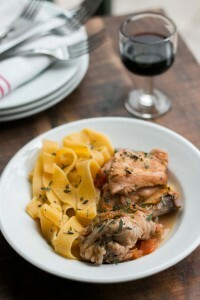 I LOVE THIS….so simple and simply delicious. I used small drumsticks because I need a bigger bite! Thanks. Un bonjour de Houston, Texas. Comme vous aimez la cuisine vietnamienne, vous pouvez preparer un melange de nuoc mam avec beaucoup de sucre semoule, ail, piment, vinaigre pour arroser dessus les wings du moment qu’ils sortent du deep fry. Essayez une fois et vous verrez. C’est pas mal. Je vivais Paris en 2007 et 2008. Si je savais que vous adorez les plats vietnamiens, j’aurais du vous inviter chez ma cuisine. Wow, those look delicious.Sometimes sweet wings are better than hot wings. yay! some decent recipes for my Actifry!!! Can’t wait to try! 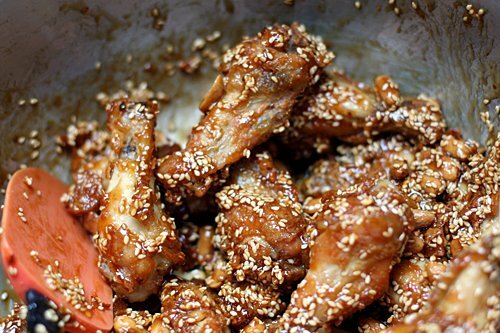 I love the sesame seeds on top of the chicken wings. Originally you were supposed to dip the celery in the dressing to cool down your mouth from the hot spicy wings. This was back in the days when 1 wing consisted of both parts and the wingtip. You mentioned frying it twice. Is this to cook the inside? I find that steaming the wings first for about 10 minutes cooks the inside well. The flavor does not seem to be affected but maybe this type of sauce would not adhere as much. Hi Charlotte: I didn’t fry them twice, but Maangchi does in her recipe, which I mentioned because I adapted this recipe from hers. Your chicken dish looks better than mine! : ) I hope you enjoyed using my recipe. yes, everybody knows you are an excellent cook, baker, blogger, and a cookbook writer! I have been your fan for a long time, too! treat all locked up. Any fusion of the two, magic. As long as they are truly crisp and fresh…. Thank you for sharing this delicious Korean Chicken Wing recipe! My husband made some last night and it was SO GOOD! We really enjoy the ginger-ry flavor in the that sticky sauce! Thanks for another great recipe! …that looks so good, I probably gained a couple of pounds just looking at it. I will definitely give it a try! Thanks for sharing.